ARCANIA is a Thrash quartet formed in France in 1999. Since then, they have released a few demos along with a self-release in 2005. 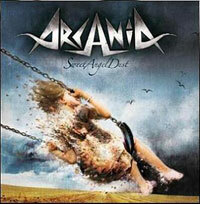 “Sweet Angel Dust” is their first full-length album by a record label. It was really hard for me to find any particular information about them on the web but what I found -and sounded really good to my ears- was that their music was very much influenced by METALLICA of the “Master Of Puppets”, “And Justice For All” etc era. These are albums that every thrash fan loves and are considered as 'classics'. So, I was interested to see if they would be able to reproduce the feeling and style of this era while managing to have their own identity and of course good songs. The first time I listened to “Sweet Angel Dust” it sounded interesting but the more I listened to it the more I got bored , the album was becoming predictable and it seemed like I have listened to that kind of staff many times in the past. Why? Because many guitar riffs sounded like a bad, cheap copy of METALLICA riffs. Of course, they don't sound completely like them, you can also find a few more Heavy Metal riffs and melodies and other elements that distinct them a little, but it is obvious that this is what they want to do. A few times they manage to sound very close to their idols, but most of the times fail. They sound like a mediocre version of METALLICA without their own musical identity. It is not difficult to become the shadow of the band that is your biggest inspiration. The difficult part is to create something different and unique based on these influences and built up your personal style and identity. There are a few very good songs like “Sweet Angel Dust” and “Memento” and generally in the album I found many good ideas that showed potential, but on the other hand many riffs and melodies sounded uninspired and indifferent. ARCANIA simply never gave me a reason why to listen to them again. The album has some good moments but really all in all it is just a mediocre attempt to sound like their Thrash idols.